The prolific Laura May is back again with a tune that anchors itself in the harder side of her reportoire. 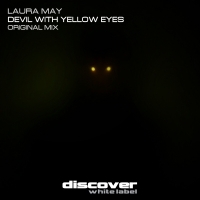 Devil With Yellow Eyes combines a multitude of influences in typical Laura May style. Techno, trance and breaks feature strongly throughout, blended to perfection, the tune is journey in the very best tradition of dance music. Devil With Yellow Eyes has a surprise around every corner with constant movement throughout to keep the ear and the dance flor more than satisfied. Laura May pushes new boundaries with every release, and we get enjoy the results. What's not to like!!! 'Devil with Yellow Eyes' is available now from Beatport and iTunes.